The older ideas about hordes of barbaric tribes and ethnic groups overrunning the borders of the Roman Empire and bringing about its downfall can no longer be supported by modern research. Germanic peoples were already to be found in great numbers in Roman (military) service; in addition it was not unified tribes, but rather mixed “alliances of necessity” which opposed the armies of late antiquity on the battlefield. Odoaker, König von Italien ab 476-493. Solidus im Namen des Zeno, Mediolanum. Zuschlag: 7.500 Euro. To this extent the term “Great Migations”, in use since the 18th century, has come under increasing criticism from historians in recent times. From a numismatic point of view “Great Migrations” indicates all mintings by Germanic tribes (gentes) from the first “pseudo-imperial” restrikes of Roman coins up through the autonomous “nationalized” coins of the Germanic kingdoms (regna). Westgoten. Sisebut, 612-621. Tremissis, Narbonne. Zuschlag: 6.000 Euro. The first stages of the migration era currencies are the so-called “pseudo-imperial” coinages – more or less successful imitations of imperial gold and silver coins which can be attributed to various ethnic groups and tribes based on their styles. Copper- (follis) and silver coins (siliqua) were “nationally” (i.e., in the name of the Germanic ruler) minted as early as the end of the 5th century. 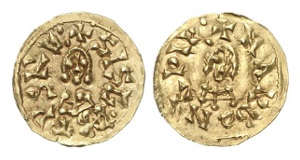 The gold coins (solidus and triens) continued to imitate the Eastern Roman / Byzantine prototypes, sometimes with the addition of a small ruler monogram in the field (e.g., GVB for the Burgundian King Gundobald, 473-516). The Frankish ruler Theudebert von Metz (534-548) was the first to put his own name on coins, whereby he broke the gold coin monopoly of the Byzantine emperors. Langobarden. Desiderius, letzter König der Langobarden, 757-773. Tremissis, Castelseprio. Zuschlag: 9.000 Euro. 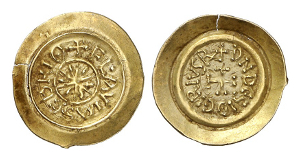 For the collector of coins from the Great Migrations, subject networks may include mintings of the Vandals (north Africa), Ostrogoths (Italy), Visigoths (France and Spain), Suebi (Spain) and Lombards (Italy), although their identification and attribution is not always simple and requires a good knowledge of the specialist literature. Experience the time of the “Barbarian Invasions” and thus the beginning of the European Middle Ages in coin images and inscriptions! Discover the Great Migrations and get to know the coins in detail, through fascinating literature. Bernareggi, E.: Moneta Langobardorum, Mailand 1983 [ital.] / London 1989 [engl.]. Grierson, P. / Blackburn, M.: Medieval European Coinage. 1 The Early Middle Ages (5th-10th centuries), Cambridge 1986. Metlich, M.: The Coinage of Ostrogothic Italy, London 2004. Pliego Vázquez, Ruth: La Moneda Visigoda, 2 Bände, Sevilla 2009. Tomasini, W.: The Barbaric Tremisses in Spain and Southern France. Anastasius to Leovigild (Numismatic Notes and Monographs 152), New York 1964. Vico Monteoliva, J. / Cruz Corez Gomendio, M. / Cores Úria, G.: Corpus Nummorum Visigothorum ca. 575-714, Madrid 2006. Anonym. Toskana. Ô-Tremissis, Ende des 7. Jahrhunderts nach Chr. ; 1.49 g. Oddy -; Grierson/Blackburn -; Bernareggi -; Arslan -.